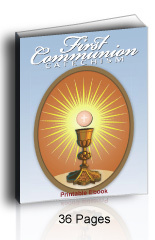 The New Saint Joseph Baltimore Catholic catechism for children series has three books: First Communion, No. 1, and No. 2. Will the best Catholic catechism for children please stand up? Are you frustrated with the Catholic catechism changes that have tormented our families for over one hundred years? A friend of ours calls this "modernist creep". This article focuses on the Resurrection as found in all three NSJBC book. I wrote this article to show you where to look for some important revisions. I have at least eight photos so you can compare these to your own copies. 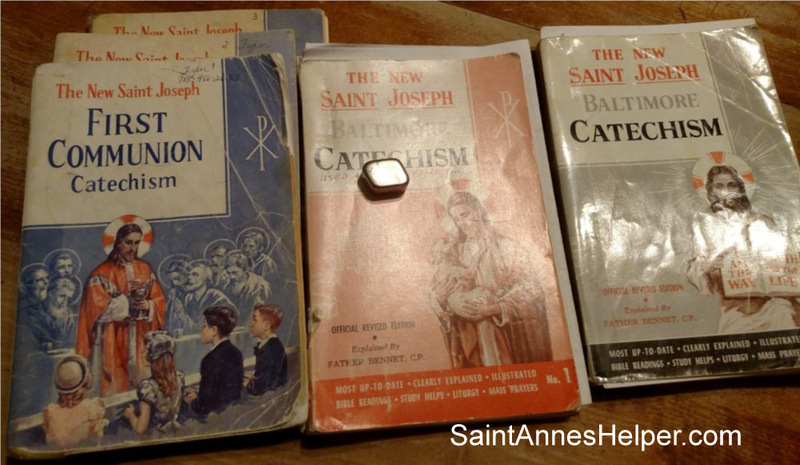 This is one of three articles about The New Saint Joseph Baltimore Catechism series (NSJBC). Part 2: The second article is about the NSJ Communion children's Catholic catechism. Part 3: This page has the third article and covers the doctrine on the Resurrection of Jesus Christ that runs through the whole NSJBC series (Communion, No. 1, and No. 2). All three use many questions from the original 1885 Baltimore Catechism. They also use its easy to memorize and concise question and answer format. Children love the pictures and drawings. They're artfully drawn and many are enchanting pictures of Jesus and Mary. The pictures make you want to use the books, they're so inviting! Many, many Catholic schools have used this series from Kindergarten to eighth grade for over fifty years. Most Catholic homeschool curriculum place these books on their K-8 book lists. Since getting to Heaven is the purpose of education, the most important course in school is the children's Catholic catechism. Learning the truth starts their lives well and reinforces good principles throughout their whole lives. Important. Did I say important? Oh, yes. Important. Important to the one thing necessary, our salvation. Very important in living a peaceful family life, a successful career, participating in good social interaction. The Confraternity of Christian Doctrine (CCD) Bible version uses unisex language rather than the Douay-Rheims translation. Faulty language about the Resurrection in all three books since 1963. This language explicitly covers the Ascension on page 170 in book No. 2. Subjective questions like "What does the sacrament of Penance do for us?" Inaccurate plural Penance and confession answers. As a result of what I've seen through many years with the NSJFCC, I have not used the NSJBC No. 1, or No. 2, at length. If I find more information, I can add to this page through time or I can write a follow up article. I think that the 1885 Baltimore Catechism (BC) better reflects the true Catholic answers. Our Lady of Victory School has made a point of developing their religion classes around the old BC and has republished the Living My Religion Series from the 1940s to this purpose. You'll want to know that the 1885 plural confession answers (uses the religious plural possessive) and the answers concerning matrimony (1917 Code of Canon Law), yet outside these few answers the BC has the best answers and prayers. The old BC No. 2 contains all three - BC No. 0, No. 1, and No. 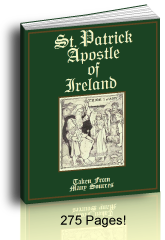 2 all in one book with the same numbers and is the best Catholic catechism for children generally available without where they do not have to memorize different answers to the same questions. The variations can be confusing. The CCD version uses unisex language and other verbiage that does not match the Douay-Rheims Bible, yes even during the 1940s. It does not follow the Catholic rule of language in rendering the Latin derived words as advised by The Catechism of the Bible, but used Anglicized terms which can give different meanings in English. For example: The term "word" is often rendered as "utterance" which is strange term to use when Jesus Christ is the "Word" of God. More examples: The CCD reduced words like testament to covenant or witness, tabernacle to tent, multitude to crowd, and reduced the terms of authority like "governor" to words like "official". This was enough for me. If your children study Bible quotes, use the chapter and verse references the booklet gives to find the same quotes using the Douay-Rheims Bible. The following sections will show catechism comparisons from The Catechism of the Council of Trent and The Catechism Explained on the Resurrection above (Section 2 and 3) to find the contrast between the old catechisms and the new on the truth of Jesus' Resurrection. 2. Did Jesus Rise By His Own Power? Or Not? A. Jesus Christ Resurrection – Yes or No? 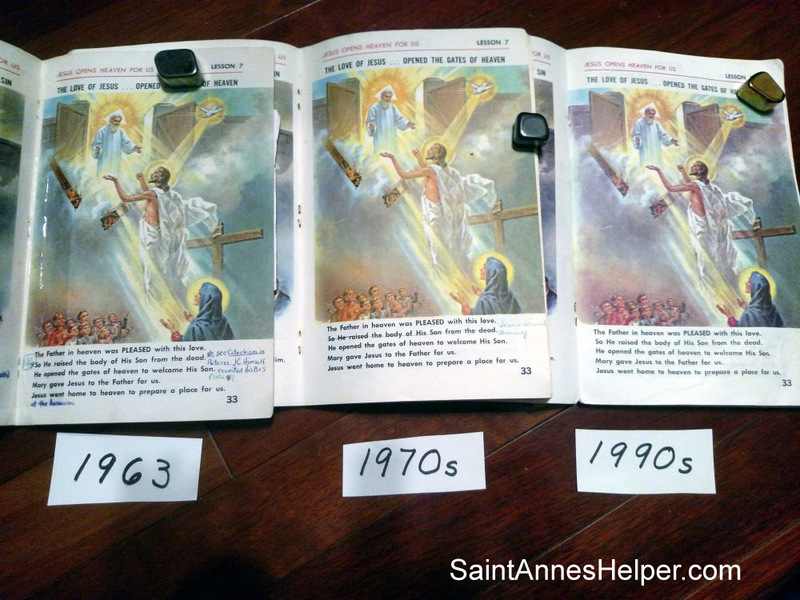 Catholic Book Publishing Company changed many phrases through the years between 1963 and 2012. Page 59 used to have the Latin and English dialogue Mass responses that were replaced by cartoon drawings. Most of these particular changes alone do not make the Communion Catechism un-Catholic. There is simply information missing. 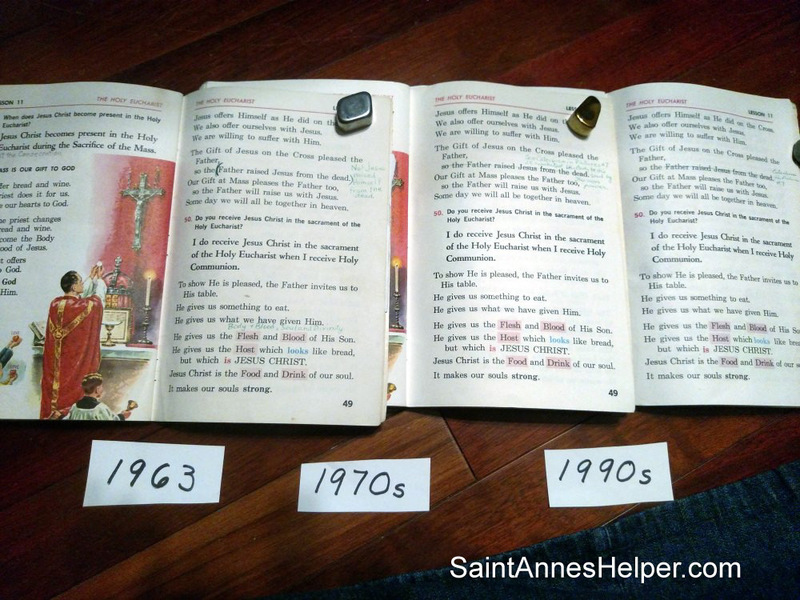 Of course, many Catholic catechism for children companies made these changes to match the changes from the old Mass and from the old disciplines to the new. The most problematic words in all three books and through all these years are about the Resurrection and the Ascension. It surprised me that the original 1963 catechism had had these same words, the difficulty has persisted through all these years. These terms are also repeated in higher levels. Jesus Christ rose from the dead by His own omnipotent power. On page 33 Catholic Book Publishing Company infers that only the Father acted in raising Jesus from the dead. Also, the successive statements seem as if to say that raising Him happened at the same time as Jesus went to Heaven. It's good to see that comment about the Ascension uses the active voice here, although it is not so in other iterations of this Catholic catechism for children. At least this text is not an answer to be memorized. It is in captions and explanations. Page 33 "The Father in Heaven was PLEASED with this love. So He raised the body of His Son from the dead. He opened the gates of heaven to welcome His son. Mary gave Jesus to the Father for us. Jesus went home to heaven to prepare a place for us." Perhaps children preparing for First Communion might not notice this, yet it is important to teach explicitly, in so many words, that Jesus Christ rose by His own omnipotent power and that He ascended into Heaven forty days later on Ascension Thursday and by His own power. Simplification can be helpful, as long as it does not confuse the children. I wrote more on these points below. This is the way the words were written in all the editions I own. See page 33 in this photo. The New Saint Joseph First Communion Catechism, page 33: Jesus Christ rose from the dead by His own omnipotent power - as He said He would. Page 33 infers that God the Father alone acted in raising Jesus. Remember to teach that the Ascension was forty days after Easter. This is repeated on page 49. "Our Gift at Mass pleases the Father, too, so the Father will raise us with Jesus. Some day we will all be together in heaven." Since it is essential that children know that Jesus rose by His own power, the teacher must make this clear. I'm glad that the comment is not within the questions to be memorized. Writing is a dangerous business because the more that is written, the more possibility there is for error or an oversight. Hopefully this is the case with this Catholic catechism for children. If the statements are purposeful, the extra text (fluff) is an easy place to hide an error. So many times tainted books hide error at the 2/3 to 3/4 mark where catechists aren't so alert. Priests, teachers, and parents read the first half of the book, check the last chapter, and think that the rest must be fine. Pope Saint Pius X's encyclical Pascendi covers how easy it is for good priests to miss bad elements in a book. It is even harder for the laity as we are distracted and pressed for time. Page 49 infers that God the Father raised Jesus. It also makes it seem that He will do the same with us and we will all go to Heaven. The NSJFCC page 49 phrases the truth of the Resurrection in a way that does not make it plain that Jesus rose by His own omnipotent power. Yes, it's true that when one Person of the Blessed Trinity acts, they all Three act; yet see the explanation from The Catechism of the Council of Trent further down this page that shows that it is important to teach that Jesus rose by His own power using the active tense. The words also infer that God the Father will do the same for us. It says explicitly that "Some day we will all be together in heaven." Nice thought. Sadly, not true. The words about the Resurrection are repeated through the higher level NSJBC books and expand to include the Ascension in No. 2. See more on the Ascension in part 3. On the the Resurrection, if you're going to use Catholic Book Publishing Company's NSJBC No. 1, you will want to teach explicitly that Jesus Christ rose from the dead by his own omnipotent power as per The Catechism of the Council of Trent. "To show He was pleased, the Father raised the body of His Son from the dead and took Him to heaven with Himself." Yes, it is true that when one of the Blessed Trinity acts, all three act as well; yet is an important point that Jesus rose by his own Divine power as He said he would. The Resurrection proves that Jesus is God. Plain and simple. If the children are not explicitly taught this, they won't know it; and will not know that the Resurrection is the proof of His Divinity. Try to make the connection for your students that, as the Second Person, Jesus is God; and the Resurrection is the proof of His Divinity. It is fulfills the promise to Adam and Eve, so this is a very important doctrine. Saint Paul mentions that if Jesus did not rise, our faith is in vain. Another thought here is that by the word "and" the second half of this statement can appear to combine the Resurrection and the Ascension as one event. You may have seen students who confuse those events. This may be why. Be sure to make the distinction for your students so they can remember the holy day better. The NSJBC No. 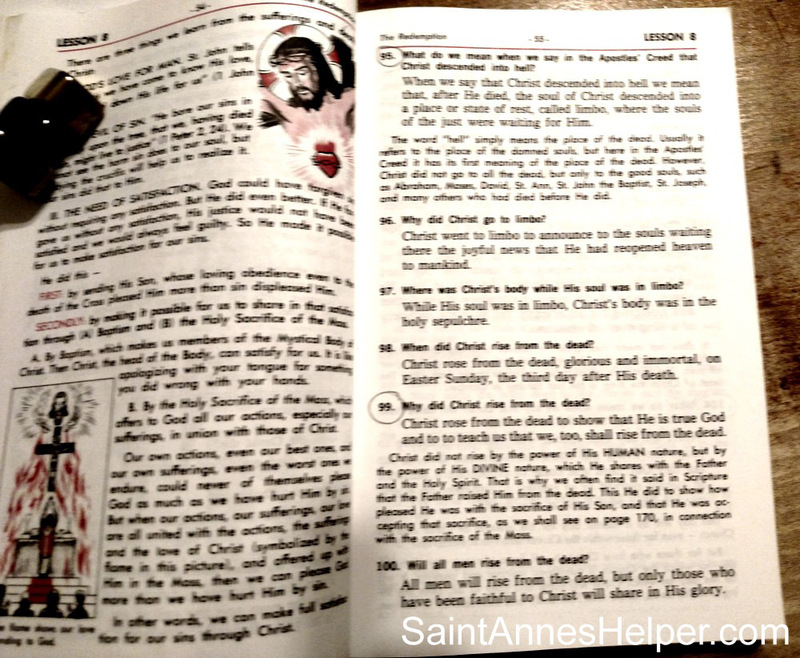 1 page 42 Catholic catechism for children unites Jesus' Ascension with His Resurrection. 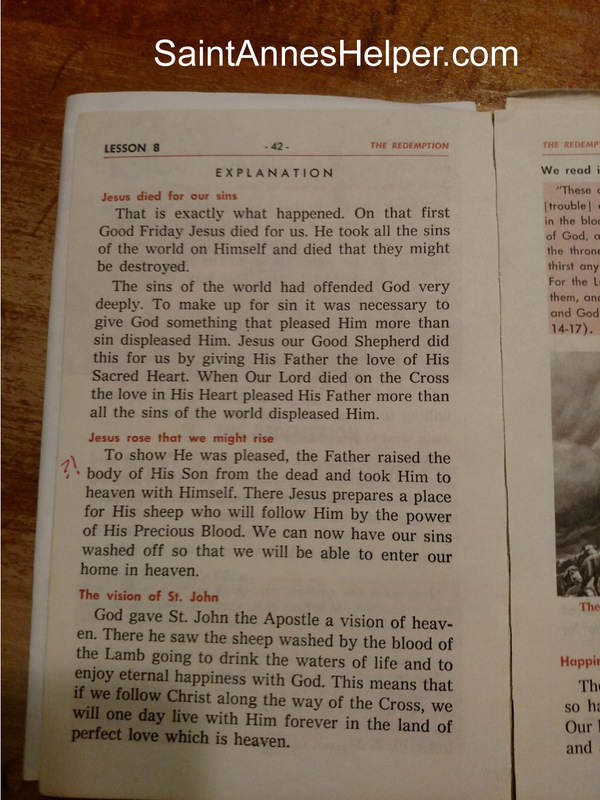 If you are obliged to use this book, teach the children that the Resurrection happened on Easter Sunday and that the Ascension was forty days later on Ascension Thursday, a holy day of obligation. "Because He was pleased, the Father accepted the sacrifice of His Son. He took Him to heaven as a sign that He will take all others there who will share in the sacrifice of His Son." Again, it is the Father acting not the Son, and the Redemption is not taught as a sign of Jesus' Divinity – that He is God. At the question marks you can see where the No. 2 does not distinguish between the Resurrection and each person's individual ascension. NSJBC No. 2 page 53 the Resurrection and Ascension are combined. Finally, after several years into the NSJ program on page 55 question number 99 teaches the children that "Christ rose from the dead" with the active verb tense. They now learn that He rose to "show that He is true God". Finally after several years, this series teaches this truth explicitly. It's too bad if the children never get to this level or figure the difference. "That is why we often find it said in Scripture that the Father raised Him from the dead. This He did to show how pleased He was with the sacrifice of His Son, and that He was accepting that sacrifice." Yes, there is such a Bible quote, but this is not the point. See the First Communion notes about the Resurrection above and remember to teach that the Ascension was a separate event when Jesus Christ ascended into Heaven forty days after Easter when you teach or read page 33 and 49. The NSJBC No. 1 Catholic catechism for children tells the Ascension like the NSJFCC by combining the Redemption and the Ascension on page 53. "The Father was most pleased. He accepted the gift His Son offered Him and showed it by raising Him from the dead on Easter and bringing Him to heaven forty days later, on Ascension Day." Again most children would understand this to be the Father's action excluding Jesus' own action. There's also a picture with the caption, "Father's Glory Raising Christ". NSJBC No. 2, page 170: The text and drawing do not teach that Jesus rose from the dead and ascended into Heaven by His own omnipotent power. The NSJBC No. 2, page 170, has text and a caption under the drawing where we see that Catholic Book Publishing Company again refuses to teach plainly that Jesus rose and ascended into Heaven by His own omnipotent power. There's such a mix in this quote that it's hard to untangle. Due to this sort of language, we did not use the No. 1 and No. 2 books with our own children (which means that you may find more to beware in this series and its reprints than I have). The Communion booklet was enough of a red flag warning for me not to try to wade through more of this Catholic catechism series. I could not be certain that I would "catch" all the errors and nuances, or that I would be able to prevent the children from reading or believing them either at face value or worse. There came a time in our family when the catechism questions and answers became a matter of duty of state. We had to choose which questions and answers we would teach, so we had to have a good catechism (See Jesus Comes above at Amazon). What might have been worse is to have our children think that we as Mr. and Mrs. Parents decided without proper church authority that this part was right and that some other part was wrong. 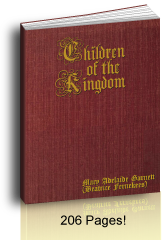 We had to find the answers in such good books as The Catechism of the Council of Trent, before we had full certitude and before we could definitively teach our children rather than just avoid the issue. If there's a better answer, one does best to learn it correctly the first time. We also could not risk that we would omit teaching important doctrines. Why waste the time on a questionable book? "This, then, the faithful must believe without hesitation, that Jesus Christ, having fully accomplished the work of Redemption, ascended as man, body and soul, into heaven; for as God He never forsook heaven, filling as He does all places with His Divinity." "The pastor is also to teach that He ascended by His own power, not being taken up by the power of another, as was Elias…. Neither did He ascend into heaven solely by the exercise of His supreme power as God, but also by virtue of the power which He possessed as man. Although human power alone was insufficient to accomplish this, yet the virtue with which the blessed soul of Christ was endowed was capable of moving the body as it pleased, and His body, now glorified, readily obeyed the behest of the soul that moved it. Hence we believe that Christ ascended into heaven as God and man by His own power." I wish all catechism books were written as clearly as The Catechism of the Council of Trent, especially Catholic catechisms for children. It's best to be plain spoken. "Hence we believe that Christ ascended into heaven as God and man by His own power." It is a very good book, and it is what we used as our high school catechism. "He ascended into heaven by His own power." By the way, this is an excellent book for ancient and Biblical history as it combines history and the catechism. 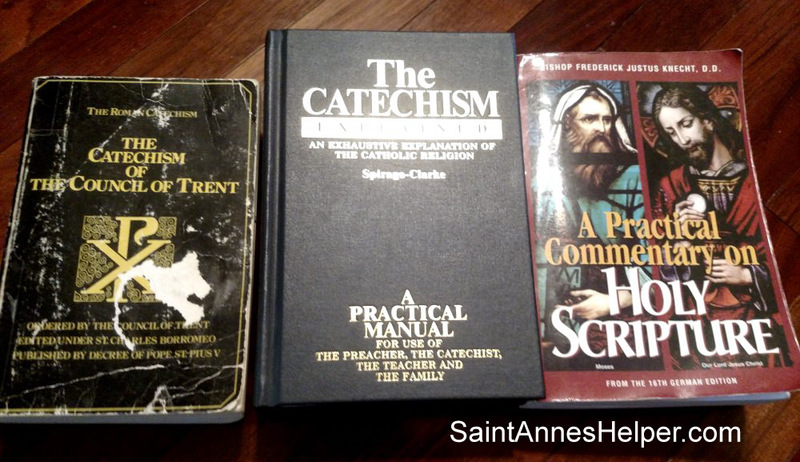 All three books, the CCT, The Catechism Explained, and the Practical Commentary are treasures you'll want to read. The NSJBC Catholic catechism for children: Resurrection. The NSJ Baltimore Catechism No. 2 question number 99 answer is good, yet the explanation undermines it. It also points to where one can find the other reference to the Ascension, page 170. What does the sacrament of Penance do for us? The way one asks a question often predisposes the answer. With children it is so important that we dispose them well. They will gain the most graces from the sacraments depending on how well they are disposed to receive them. It does not take a huge academic effort, meaning that they do not have to be able to read and write (especially in order to go to Confession or receive Communion). Learning the true doctrines and praying can be simply done and offers children the best foundation in Faith. Today, many a Catholic catechism for children, including The New Saint Joseph Baltimore, asks subjective questions and/or answers as with "What does Baptism do for you?" If the children learn the definition, they'll know the subjective answers in all its flavors throughout all their lives. The truth applies to each child personally once they know the objective definitions. For example: Children should know that Baptism operates objectively the same for everyone. From objective knowledge we can move to subjective, or personal, knowledge, love and service as we personally strive to become saints, yet good answers help guard all this. See this in this article's second part on Catholic Sunday school changes. You'll see more on plural answers in the first part of this article's series. Briefly here I'd like to mention that this series uses the religious "vocabulary" of speaking in second or third person in reference to the first person singular. The Communion booklet to its credit has at least one first person singular question, yet explanations remain in the second person plural. For example: The New Saint Joseph Baltimore No. 1 Q. 171 uses the terms "we must", "confess our sins", etc. You see, some children don't pay attention to the fact that each child should confess only his own sins. The 1950s Our Holy Faith Book Two, Jesus Comes, corrected the plural confession answers from the original 1885 Baltimore Catechism. 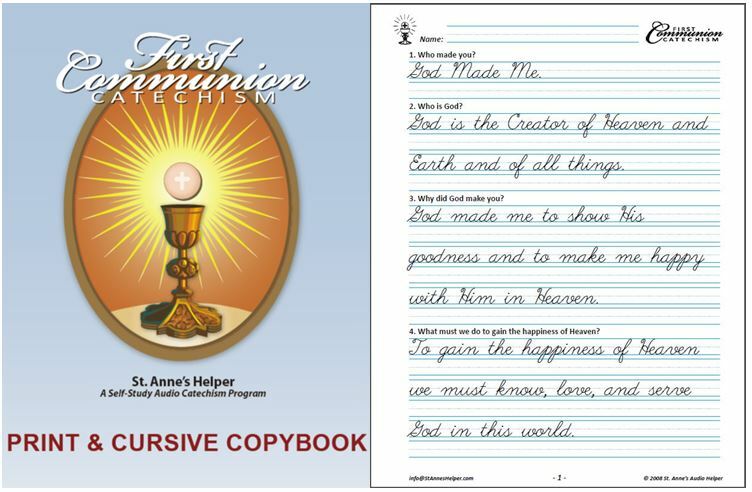 This is the version that Saint Anne's Helper First Communion Catechism uses. As through the whole book and series, there are places where the plural does not fit as with "our" soul which ought to be "our souls" as we all do not have one soul. The NSJFCC page 26 has the correct plural and singular form and a singular answer is on page 41, yet the explanation on page 42 is still plural. This is something to know ahead of time before the children memorize the plural version. Another reason the authors may have used the possessive plural is to avoid offending where the confession questions might sound too accusative. That's sweet, yet I think that over time as a mother of eight that the best idea is to use the singular answers. A remote danger to beware is that plural confession answers can prepare a child's mind to accept the strange idea of a corporate conscience which is dangerous. The largest examples of this error were of prelates since the 1980s apologizing for supposed historical events from earlier centuries. Older students can understand the importance of this danger, yet young children simply need to memorize the singular answers: "I confess my sins…." as used here at Saint Anne's Helper. See more in the first article in this series on Catholic catechism for children changes. If you know of more Catholic catechism ideas, contact me. Tried and true Catholic catechisms. So what can you do? Either edit the materials you already have or find another book. It's been a consolation to me to be able to find Catholic sources like The Catechism of the Council of Trent. Certitude is a wonderful blessing, meaning that it is a consolation to know that a truth is certain. I apologize if I've missed something big in these books from Catholic Book Publishing Company. I do not use them, and want to warn you the same way I hope this page will warn our own children and grandchildren. If you must use these catechisms, you and your family can now beware these points. If you know more, I would like to be able to mark the place in my booklets. Please email me on our contact form. 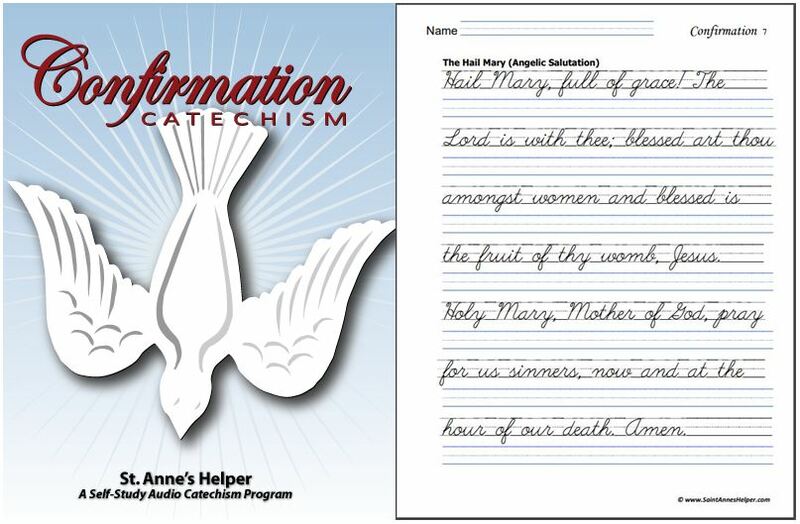 Saint Anne's Helper Communion catechism, Kindergarten through 3rd grade. 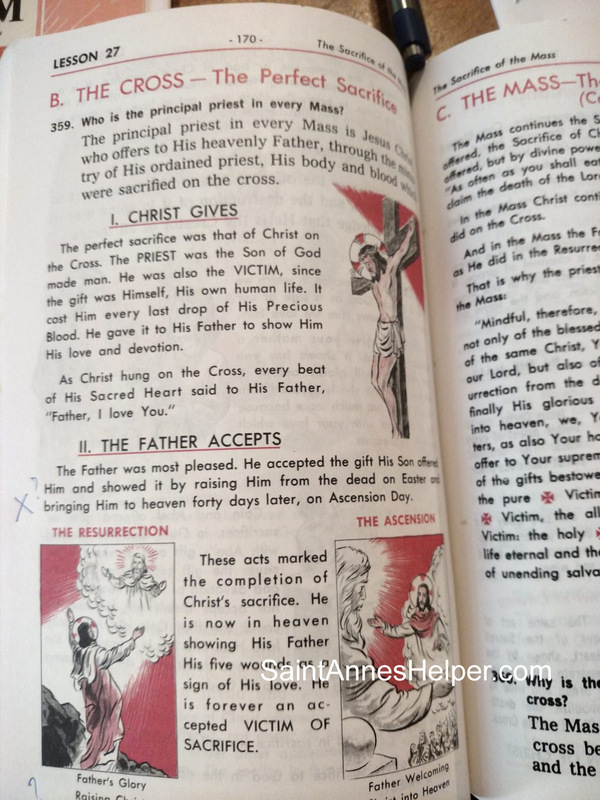 Saint Anne's Helper Confirmation catechism, 3rd grade and review through 8th grade. The old Catechism in Pictures for elementary school – teach it during the 7th grade and let them read it through the 8th grade. 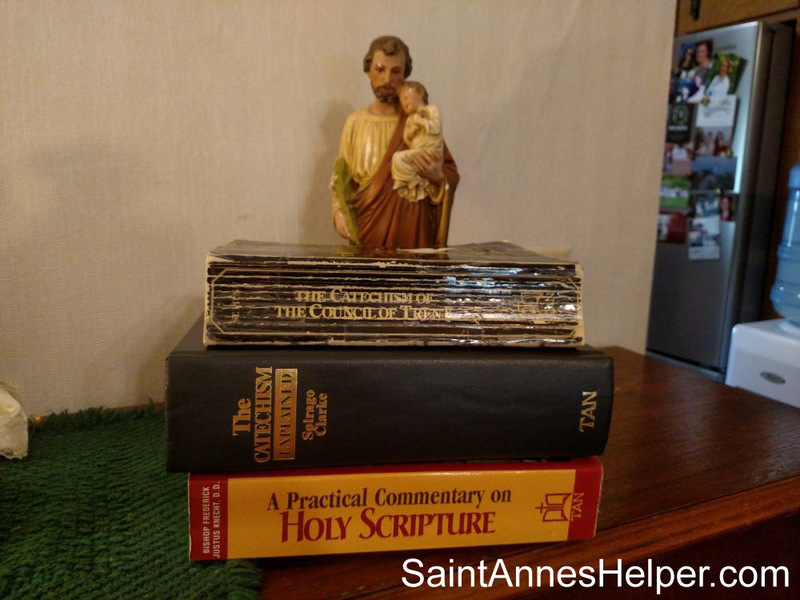 A Practical Commentary On Holy Scripture, 7th to 12th grade. The Catechism Explained for 10th through 12th grade and as a reference book. It has an excellent index for such an old book. The Catechism of the Council of Trent for 11th and 12th grade. May the real Saint Joseph pray for us! It's awesome to read the Catechism of the Council of Trent and A Practical Commentary On Holy Scripture before teaching the catechism to children.